This is the regular gold priced in Pound Sterling update for August 2012. The last update was in May 2012 and can be found here. 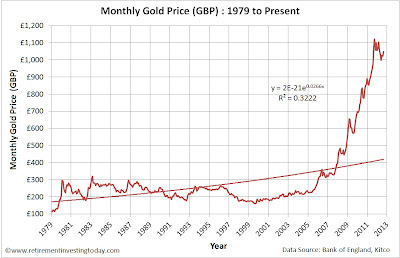 The chart below shows the Nominal Monthly Gold Price since 1979. The Nominal Gold Price is currently £1,049.60 which is a large 5.3% above the May 2012 (ie Quarter on Quarter) Price of £996.68. 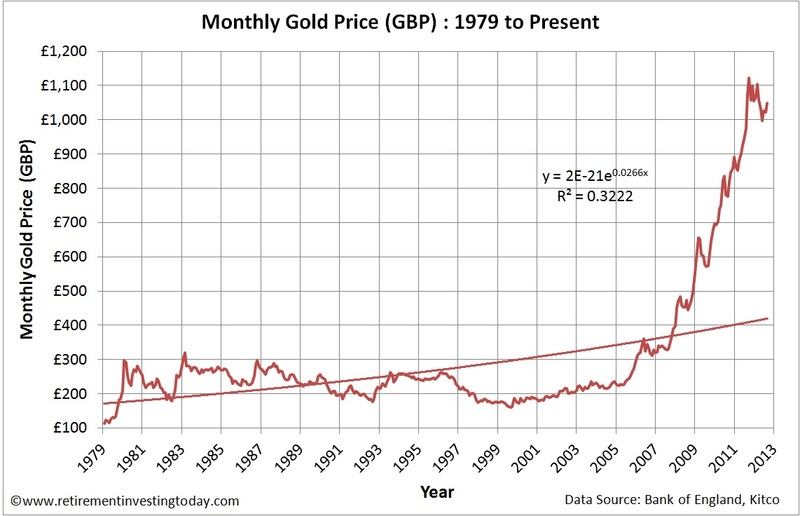 Year on Year Nominal Gold is 2.2% below the August 2012 Price of £1,073.17. The chart below then adjusts this chart by the continual devaluation of Sterling through inflation. 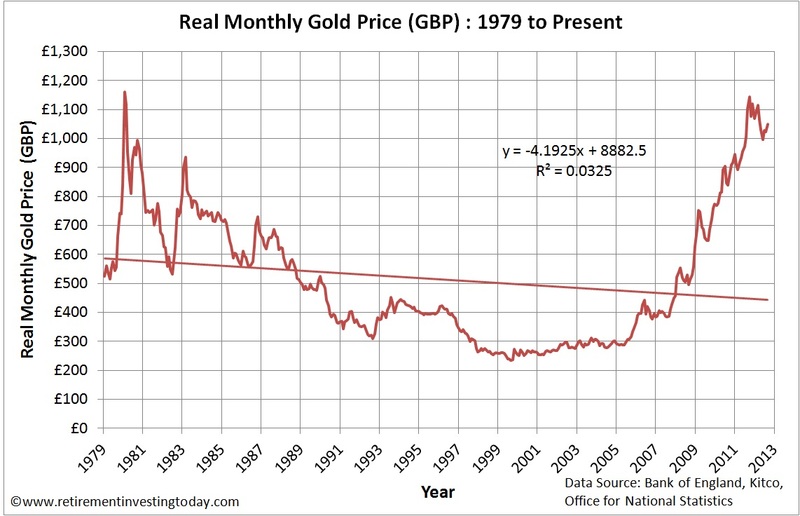 Real Gold Peak Price was £1,161.31 in January 1980. At £1,049.60 we are 9.7% below that peak today. The long run average is £514.90 which is indicating a very large 104% potential overvaluation. 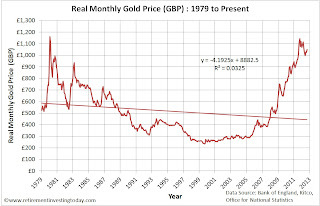 The trendline indicates the Real Gold Price should today be £444.40 which would indicate even further overvaluation today. I choose to hold a large portion my Gold using the ETF Securities Physical Gold £ Exchange Traded Commodity (ETC) with ticker PHGP. This product is intended to provide a return that is in line with the gold spot price less fees of 0.39% per annum. It is also physically backed with allocated gold held by HSBC Bank USA. I have chosen this method as it is simple, convenient to buy/sell, no nonsense and avoids other risks which include contango and backwardation that occur with Futures based ETC’s (including Gold) to name but one. Recent movements in the Gold Price have also demonstrated how my simple buy, hold and rebalance strategy can result in selling high and buying low giving that little extra portfolio performance that I am chasing. I reported at the last update that I was forced to sell 20% of my gold holdings on the 19 August 2011 at a PHGP Price of £109.5462. There was no skill in this just a pre-determined mechanical strategy that says I sell if my holdings go 25% above my nominal holding of 5% (ie sell at 6.25%). Since then I was forced to buy Gold again on the 20 July 2012 at a PHGP Price of £98.8039. Again, there was no skill in this. This time I had to buy as my gold holdings had fallen 25% below my nominal holding of 5% (ie buy at 3.75%). By being forced to sell and then buy back in I protected a small portion of my portfolio from a fall of nearly 10%. I’ll take that. So where do my gold holdings sit today? I’m at a 4.7% holding, when compared to total portfolio value, against a target of 5.0%. Do you hold Gold or any other commodity as a portfolio diversifier? Last gold price actual taken 30 August 2012. All other prices are month averages taken from the Bank of England. August 2012 inflation is extrapolated from the retail prices index (RPI).